Button: Who is Rudolf Elmer? 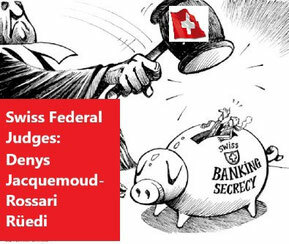 PUBLIC HEARING (link): FEDERAL COURT OF SWITZERLAND, Lausanne "Causa Swiss Bank Secrecy and Elmer" October 10th, 2018, 09.15. Registration for Admission (link). "SWISS BANKING SECRECY: TO BE OR NOT TO BE?" The global role model for secrecy laws - Swiss banking secrecy - might be defeated in its home country Switzerland by its own Swiss Federal judges. What an irony that its protectors might be forced to produce a verdict against their personal and political views but based on the governing law! All offshore vehicles (trusts, companies, partnerships etc.) holding a Swiss bank account would no longer be protected outside Switzerland, even though the information of the Swiss bank accounts is sent to Cayman, Jersey, Delaware etc. for accounting and administration purposes. The information would be accessible for foreign authorities from the point in time when the information on the Swiss Bank account crosses the Swiss border. The business model of using offshore jurisdictions like Cayman, Jersey UK, Isle of Man etc. to set up trusts, companies, and partnerships would not work anymore because the Swiss judicial system will no longer be able to protect the information - they will only be able to do that if the bank account and the vehicle (trust, company, stiftung etc.) are based and domiciled in Switzerland. An acquittal of Rudolf Elmer would be a real setback for Swiss banking secrecy. However, jurisdictions like Jersey UK, the Isle of Man, Monaco, Hong Kong etc. will profit because the bank accounts of their local offshore vehicles (trusts, companies etc.) will be held in their jurisdictions under the secrecy law of that jurisdiction. Because Switzerland does not have any trust law, partnership law etc. it means that many bank accounts will be moved to the place where the trusts, companies etc. are domiciled respectively set up! (Link to the complaint of the Higher Prosecution Office Peter Pellegrini dated Nov 21st, 2016: thousands of Swiss banking jobs lost!!). More importantly, acquittal by the federal judges would not only be a disaster for the financial industry of Switzerland but also for the industries such as commodity trading, precious metal refining, insurance, food, the pharmaceutical industry etc. due to the fact that the money flow from those industries goes through Swiss bank accounts and all too often through global offshore jurisdictions as well.